The 22-year-old pop star hit the big time in 2005 after she was signed to Def Jam Recordings by rap mogul Jay-Z, who was overwhelmed by her powerful voice and feisty attitude. Now the gorgeous star has decided to part ways with long-term manager Marc Jordan so that Jay-Z’s Roc Nation Management can handle her business. Rihanna has revealed in a statement she’s “so excited to take this next step in my career”. The singer is also launching a brand new enterprise called Rihanna Entertainment, in order to “merge all of her businesses, including music, film, fragrance, fashion and book ventures”. Rap star Jay-Z and Rihanna have a long history of success together. The pair won a Grammy in 2008 for the international smash-hit song Umbrella. They then racked up another two Grammys earlier this year for their single Run This Town, which also featured the talents of Kanye West. 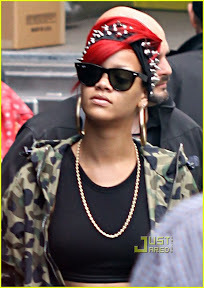 Rihanna’s fifth album, entitled Loud, is set for release next month, and is hotly anticipated by fans and critics alike.